Two competitors engage in a battle of wit at the Southern California State Scholastic Chess Championship at the Hyatt in Valencia Sunday afternoon. | Photo: Cory Rubion/The Signal. Parents, coaches and eager, young chess masters crowded into the halls, patios and conference rooms of the Hyatt Regency Valencia for the annual Southern California SuperStates Scholastic State Chess Championships on Sunday. 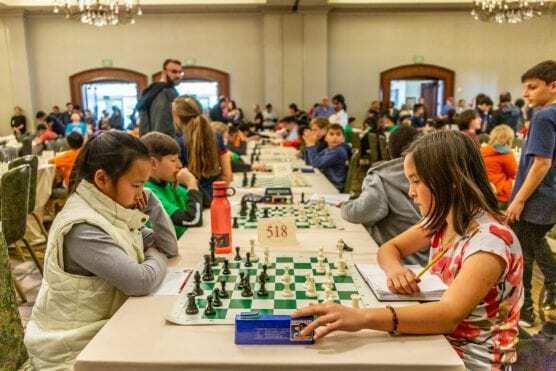 This was the 22nd year that Jay Stallings and his California Youth Chess League have hosted the state championships in Santa Clarita and the ninth year that the tournament has been held at the Hyatt. The competition was broken into different age groups and was open to members of the US Chess Federation. Over two days, the young chess players competed in five rounds of two games each to assert their mental dominance over their peers in both team and individual divisions. In addition to the traditional chess competitions, SuperStates held tournaments for speed chess and for different variations on the traditional game. J.J. Arrington, a Castaic resident, has played chess for three years and competed in SuperStates for the second time on Sunday and said he performed better this year. Robert Romano, who teaches chess at Laurence School in Van Nuys, brought eight students to the tournament. Three of Romano‘s students, Calvin Kim, Alex Galstian and Maxwell Weidenfeld practiced with each other in between rounds. While Romano was concerned that the two-games-per-round format would be tiring for his students, they accepted the challenge.